Stores Ref. 22c/227. Size 7. 1941 dated. Classic Battle of Britain boots identical in pattern to the earlier 1936 pattern but with vulcanized canvas uppers. The leather shoe section is in very good condition with only minor wear and tear. The canvas uppers are also good, they retain strong colour and suprisingly do not have the usual wear at the ankles. 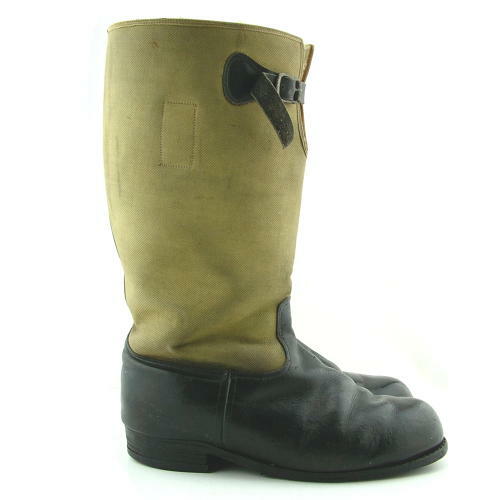 This pair is fitted with the black leather strap/buckle as found on the earlier 1936 pattern boots. The linings are much better than most '39 pattern boots with only a little moulting / fur loss in the ankle area and upper edge of the right boot - none of which is too detrimental. Fitted with original insoles. The original stitched soles are rather worn but undamaged. The heelplates may have been replaced at some point. Complete with clear Air Ministry King's crown markings and 1941 date code on the puller in each boot. Also has a name and service number inked on the other pullers. A very good '+' used pair of these rare early boots. Stock code B20233.